There was cause for double celebrations for Investec Songo Specialized as they put themselves in an almost invincible position on Langvad’s birthday. 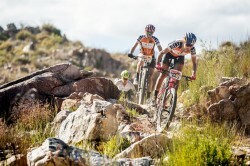 Annika Langvad celebrated her birthday by winning a “brutal” Stage 4 of the Absa Cape Epic with her American partner Kate Courtney on Thursday and extended their lead in the Women’s category to an almost unassailable 32 minutes. The birthday presents started rolling in for Langvad even before the start as their nearest rivals, Ariane Lüthi and Githa Michiels (Team Spur), were forced to withdraw with the tough Michiels picking up a fever overnight and being advised not to start by the race medical staff. And then out on the course the Investec Songo Specialized pair broke away early on the 113km stage from Worcester to Wellington as their rivals let them ride off the front. By the time they reached the finish Langvad and Courtney could celebrate a win of over eight minutes over Mariske Strauss and Annie Last (Silverback-KMC), with Robyn de Groot and Sabine Spitz (Ascendis Health) just more than a minute further back. It is hard to see Langvad and Courtney not being crowned the 2018 champions when the race finishes at Val de Vie Estate on Sunday, but the leaders refuse to concede that their victory is finalised. “Day by day it looks better and better, but we are not going to jinx anything because we know that even a tiny little issue can cause a lot of problems,” said Langvad after crossing the line. “It was a really tough birthday present to myself. That was the hardest day out there so far this year. It was brutal – super brutal. There was so much single track, so much concentration, so much power and so much on-the-gas all the way through. “It did not feel like we were dominating out there. “Mariske and Annie put the hammer down big time over the first half of the stage. I was sure that we were not going to make it but after the hotspot sprint they sat up and we just slowly pulled away. Courtney agreed that it was a tough way for Langvad to celebrate her birthday. “That was a tough present to give … it was a really hard day for us, and it was very tough for me. Some of my weaknesses are flats and sand and there was a lot of that today. The real battle in the Women’s category is now to decide the positions of the bottom steps of the podium with Strauss and Last holding a nine minute advantage over De Groot and Spitz after the Silverback-KMC pair added a minute in the closing kilometres of the stage. Friday sees the competitors ride the second time-trial of this year’s Absa Cape Epic and the 39km race against the clock. The lumpy profile of Friday’s route is an indication that big chunks of time can be won and lost if somebody is struggling. “Tomorrow is going to be hard,” said Strauss after the finish. “But at least we can do our own thing and don’t have to worry about people around us. Like we saw last year, and this morning with Githa, anything can happen so you have to keep chiselling away at the big block and see what happens.